state senator from Indiana’s 46th District. Kimberly Wrigley, graduating senior at IU Southeast, has always had an interest in criminal justice. Now, as one of three recipients of the IU Regional Law Scholarship, she will be able to pursue her passion at the Indiana University Robert H. McKinney School of Law. The IU Regional Law Scholarship provides a minimum of a renewable half-tuition scholarship, as well as guaranteed experiential learning opportunities or paid employment as a research assistant following completion of 32 law school credit hours. The total value of the scholarship is approximately $40,000 over three years. Current students and alumni of IU Southeast, Northwest, South Bend, Kokomo and East are eligible to apply. To be considered for the scholarship, interested applicants must complete an application to the IU Robert H. McKinney School of Law. To be fully eligible for the program, applicants must receive an admission offer from the law school. Each campus can nominate up to three individuals for consideration. A total of three award recipients are selected by a scholarship committee. Wrigley is the second IU Southeast student ever to receive the scholarship. Wrigley will walk across the stage at commencement in May, earning degrees in criminal justice and business. Wrigley has been involved in numerous organizations during her time at IU Southeast. She’s served as the president of the Criminal Justice Student Association, a member of College Republicans and the communications director for Launch, IU Southeast’s new entrepreneurship business club. After working with an attorney in Louisville who was running for a judicial position, Wrigley developed an interest in government and politics. 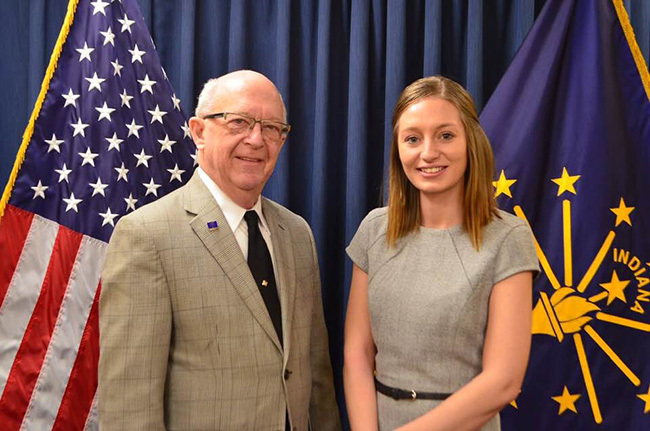 She currently works as an assistant to Ron Grooms, the state senator from Indiana’s 46th District.